Today has been an exciting day. This morning we noticed that one of the many active galaxies in the Fermi sky had become extremely bright in gamma-rays. We decided to interrupt our usual mode of continuously scanning the entire sky, and instead repointed the spacecraft to stare right at this galaxy for the next few days. This will allow us to track very carefully how it behaves during these bright outbursts. This is the first time that we have ever chosen to repoint the spacecraft to look at an interesting flaring object. We call these kinds of unplanned observations “Targets of Opportunity”. This object, known as 3C 454.3, has been exciting to watch throughout the mission. Shortly after launch in 2008, when we first turned on the telescope, we noticed an unexpected bright object in the newly observed gamma-ray sky. This bright source was the topic of our very first Fermi scientific communication – an “Astronomers Telegram” to communicate to other astronomers that this was an object to watch. It then dimmed somewhat and behaved more quietly for the next year. 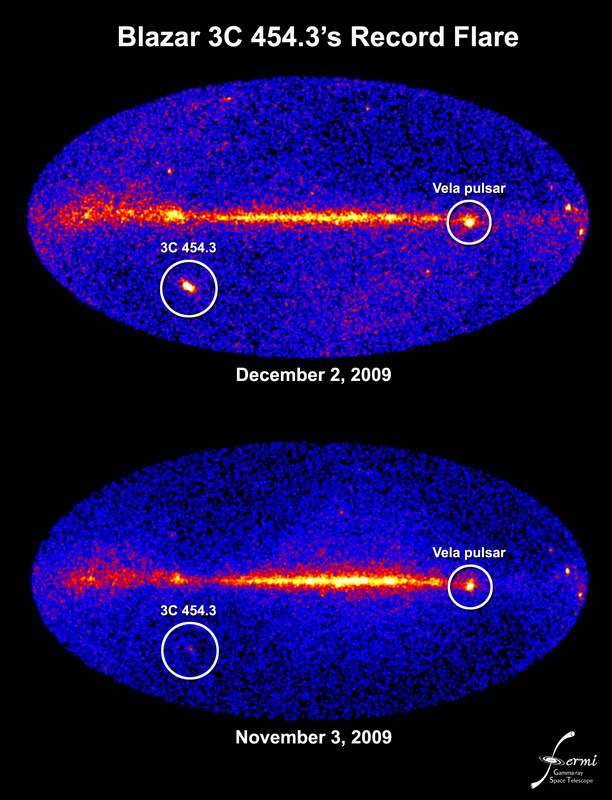 In December 2009 it flared up again, becoming the brightest persistent source ever seen in high energy gamma-rays (gamma-ray bursts are momentarily brighter, but they are over in a few minutes). We think that 3C 454.3 may now be getting as bright as it was in December 2009, or even brighter! The location of this flaring active galaxy is very fortunate. It is about 38 deg away from a star known as V407 Cyg. Last month, we discovered a bright gamma-ray flare from the direction of this star while it was undergoing a huge optical outburst. Seeing gamma-rays from this kind of stellar outburst was unexpected – this is the kind of surprise that we love to find. We have been monitoring the star very closely with Fermi and many other telescopes to try to figure out what is going on (this could be the topic of a whole blog entry all by itself). While 38 degrees seems like a big distance (it is around 80 times larger than the size of the moon), the Large Area Telescope on Fermi sees a huge fraction of the sky at once. We can easily point at V407 Cyg and 3C 454.3 at the same time. I can’t wait to see what we find from these observations! Thanks for updating. What an interesting report! Previous Previous post: A Milestone!